Every cake that leaves our bakery is treated with love, care and attention as every cake we make is handmade. Because we give each individual cake our love and attention the demand for our products has exploded causing us to be one of the fastest growing companies in the midlands. We have shown below our baking process so you can see for yourself how much we care about each individual cake. At Perfection Foods we source the highest quality ingredients including organic products (for certain ranges) to make our cakes the tastiest and freshest they can possibly be. Our cakes go through extensive tests and taste tests to make sure they meet guidelines and most important of all, making sure they taste delicious. 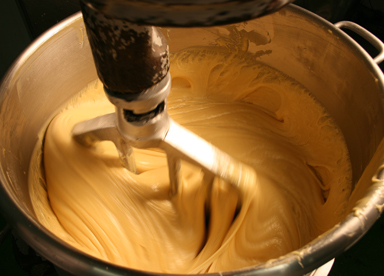 We mix all of high quality ingredients together to make our cake mixture. The cake mixture is then poured into a funnel which divides the mixture into the cake casing on the line. This part of the process ensures that every single cake has the same precise amount of mixture. 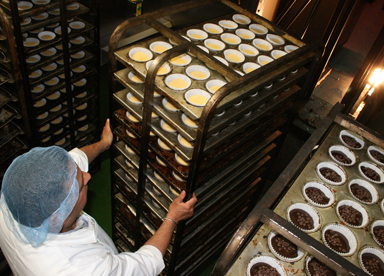 Once the cake mixture has been dispensed it is baked in our large ovens. At Perfection Foods we have invested in modern high quality equipment in order to accommodate for our high quality products and worldwide demand. The cakes are left to cook in the oven. Once baked the cakes are left to cool down. This allows the steam to add moisture to the cake and also enhances dense and sticky cakes. If it is a light or regular textured cake, we let it cool on a rack in order to keep its light texture. Once quality checked, all of our cakes are individually decorated and filled by hand using the highest quality ingredients including melted Cadburys chocolate buttons and jam. 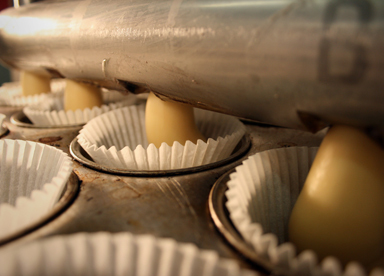 This process separates us from our competitors because every cake is given meticulous attention. All of our cakes are then packed into special packaging which helps keep our cakes fresh and delicious for many weeks. 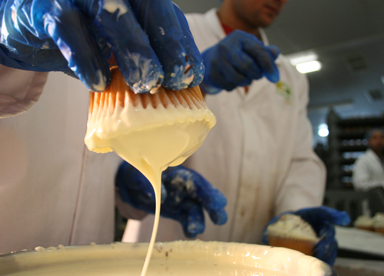 It is important to us that our cakes taste as good and as fresh in a few weeks as they did when they left the factory. 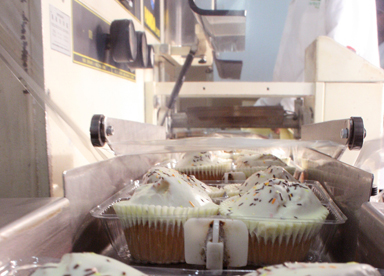 Once wrapped on the line, the cakes are packaged into boxes and make up part of a pallet ready for delivery. Our cakes are then picked up from our storage department in our new warehouse. It then begins its journey to be distributed all over the world. It is important to note that our cakes are distributed within 24 hours of being made so that our cakes remain as fresh as possible. 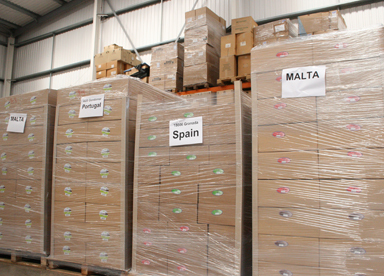 It then begins its journey to be distributed all over the world through its Export Partner Kapital Exports.